This is my first creation for 2011, finally! It has been kind of hard to get back into the swing of things since the Holidays. I am very excited about this new offering, I made one for myself already. Unfortunately there will only be two of these made, mine and yours. It is a book that I purchased at Michaels Arts and Crafts. 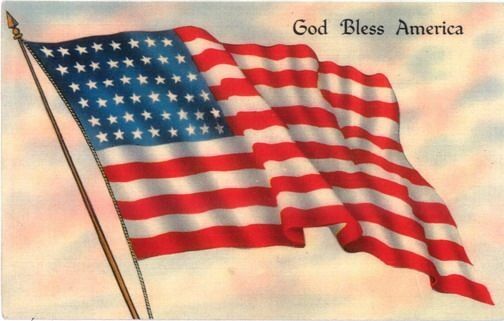 It is a wood book covered with old gray canvas that was torn and ripped up. It is lined with a dark purple velvet and has a hidden magnetic closure. 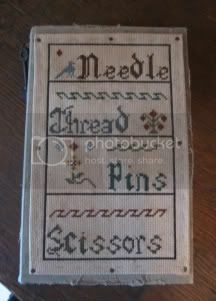 I was first using the book as it was for storing and hiding my threads, needles and such. I could just close it up and it would look like a book on my table. 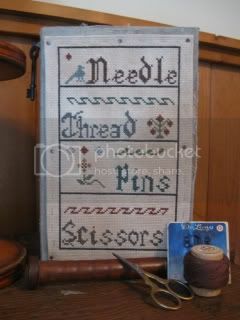 I got the idea to stitch up a sewing themed sampler for the cover of the book. I cross stitched my design on fiddlers cloth and then coffee dyed it, pressed and turned it under and hand stitched a hem. I nailed the fabric to the book with tiny rusted nails. On the binding of the book I have stamped a wise old owl and a hanging skelton key for additional whimsy. I am included some old sewing goodies, a spool of thread, an old spindle, a package of hooks and cute little pair of gold trimmed scissors. The book measures 10" long x 6 1/2" wide and 2" deep. 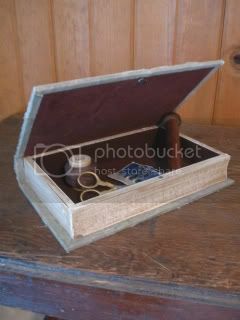 A wonderful creation to hold your sewing needs and makes a nice primitive decoration. Signed, dated and copyright 2011. This is another piece for the New Year that I cross stitched using a pattern from Country Stitches. I have been in the mood for cross stitching so I did this one that was originally called a Spring Time Sampler. I changed it up a bit and stitched an additional band at the bottom with a key, the year 1881 and a heart. 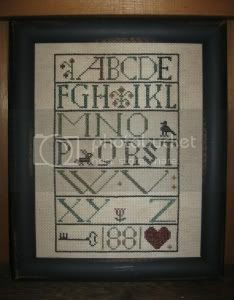 As you will notice some of the letters of the alphabet are missing which was done quite often on older samplers. 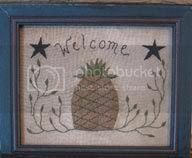 I love the charm of this sampler and it will make a wonderful decorating accent in a Primitive or Colonial home. I used a black distressed wood frame. The measurements are 9 1/2" wide x 11 1/2" long, there is glass and an attached rope for hanging. The sampler was stitched on fiddlers cloth and aged with coffee.